Racin’ Today » Ingram: Atlanta’s Spring Appeal Back On Track? Ingram: Atlanta’s Spring Appeal Back On Track? The Sprint Cup Series is leaving Las Vegas and headed to Atlanta. That brings up the question of whether a Sprint Cup date might be leaving Atlanta headed in the direction of either Las Vegas or the Kentucky Motor Speedway in 2011, which is shaping up as the year of schedule realignment. Personally, I’d bet on a 37th race being added for Las Vegas before seeing a race date leave Atlanta either for “Sin City” or Kentucky. The latter track is currently home to Nationwide Series, Camping World Truck Series and IZOD IndyCar events, which are more fitting for the track’s location and facilities than a Sprint Cup race. All three tracks are owned by Speedway Motorsports Inc., which can apply to NASCAR for date transfers. So the future remains in the hands of its chief executive, Bruton Smith. For the short term, there’s cautious optimism that last year’s rather ghastly attendance at the spring race weekend in Atlanta will not be repeated, especially after a near capacity crowd materialized on the new Labor Day weekend date last fall. This spring’s crowd in Atlanta is likely to be an excellent test of just how well the “new NASCAR” is doing in terms of ticket sales. Up until now, there hasn’t been a clear cut grandstand test. At Daytona, even the eventual race winner’s father left early due to delays while potholery became the subject at hand in Turn 2. By now, we’re used to seeing thinly populated grandstands at the Auto Club Speedway in Turns 1 and 4, so that seems normal but still disquieting in a market of that size. The crowd at Las Vegas is back closer to the usual form, but any place nicknamed “Sin City” is always going to draw a good crowd – especially for a single Sprint Cup date. As for TV, this weekend’s race in Atlanta will also be the first of the season that’s not run opposite the Winter Olympics. From dirt tracks to corporate board rooms, Atlanta is where stock car racing’s roots have always run deeply. So it will be interesting to see if the “new NASCAR’s” message is having an effect at one of the sport’s oldest tracks. Last year’s poor crowd may have been as much a commentary on NASCAR losing some of its identity as on the economy. The collective memory of stock car racing in Atlanta is a long one. The sport’s first legend, Dawsonville bootlegger Lloyd Seay, drove a Ford Roadster to victory in the first race on the dirt mile at the Lakewood Fairgrounds in 1938 before a crowd well populated with workers from the city’s original GM and Ford assembly plants nearby. Atlanta was home to the original multi-car team owned by bootlegger Raymond Parks, where NASCAR founder “Big Bill” France sometimes turned a winning wheel in the late 1930’s. Shortly after Lakewood hosted its first “Late Model” stock race to a crowd in 1949 that was double the size of the crowd at the first “Strictly Stock” race in Charlotte, the legendary quarter-mile Peach Bowl track opened on Howell Mill Rd. not far from downtown Atlanta. One year after Daytona opened its new track, the Atlanta Motor Speedway joined the ranks of high-banked superspeedways in 1960, albeit roughly 28 miles south from downtown, and has been hosting two dates ever since. As an Atlanta resident, I’m biased in favor of the home track. 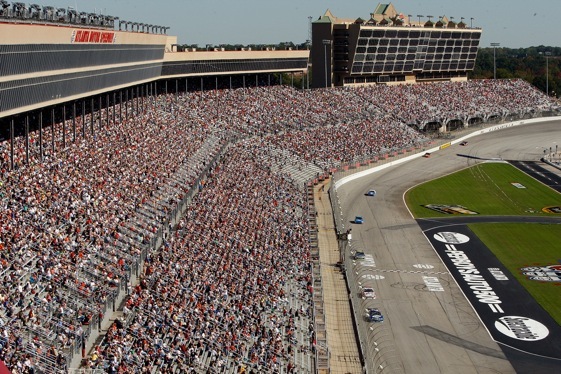 But not many drivers or fans disagree with the fact Atlanta’s true oval design – now modified to include a dogleg – makes it one of the best venues for watching stock cars due to the ebb and flow as well as extraordinary speeds. And that’s what the “new NASCAR” – now standing by for a return to blade spoilers – is supposedly all about. So what happened in the dreaded spring of 2009? It’s a just a hunch, but the answer might be found in the parking lot. Invariably, the Atlanta parking lot is full of Ford and Chevy pick-ups. There’s probably 19 of them for every Dodge Ram and likely 49 of them for every single Toyota Tundra. It’s a Ford and Chevy town. The meltdown of the economy that began in the fall of 2008 and continued through January of last year hit Atlanta as hard as anywhere. But the heart of Atlanta’s job losses came from the closure of the assembly plant for GM on the city’s north side and the Ford plant just up the road from the speedway. At a time when Joe Gibbs Racing’s Toyota team was coming off a season where it had dominated the Sprint Cup victory lane, a core group of Atlanta’s racing fans were sorting through some unexpected options for their futures. After switching from a late fall date to the Labor Day weekend, the AMS president, Ed Clark, and his facility bounced back big time last summer. It got back to roots that began at Lakewood in the 1930’s and continued at Darlington with the Southern 500. The race in the cool of the summer night left plenty of time for cooking out and partying, creating the most fun and excitement at AMS since the days when it annually hosted hotly contested season finales in relatively cold weather. The weather has always played havoc with the early March Atlanta race weekend in terms of both rain and cold. After a long, cold and snowy winter, the forecast for this weekend calls for moderate temperatures and sunshine, so that’s a plus. It’s been a long time since Kasey Kahne drove the Richard Petty Motorsports Dodge to victory on the Labor Day weekend, which provides a far bigger gap between events at AMS, another plus. The economic meltdown is also in the rearview mirror, although the climb out of recession continues to be a slow one in Georgia and Atlanta. Given that Dale Earnhardt Sr. remains the track’s all-time winner with nine victories, it can only help that Dale Earnhardt Jr. finished second at the Daytona 500 after the driver showed flashes of the family’s longstanding brilliance. And who knows? Maybe folks will also be inclined to turn up just to see if he can beat Hendrick Motorsports teammate Jimmie Johnson, the four-time champion now on a two-race winning streak. Quotes of the Week: In preparation for the season opener in Sao Paolo on Mar. 14, Danica Patrick attended the IZOD IndyCar pre-season test at the Barber Motorsports Park (where it was too cold to call it Spring Training) in between Nationwide Series races at the Auto Club Speedway and Las Vegas. She has said driving stock cars will help her figure out better how to get better balance from her IndyCar set-ups. But will her stock car experience help her in traffic on ovals during IndyCar races? “They’re opposite much like the set-ups are opposite,” she said. “When you’re in the draft at Daytona, let’s say, everybody behind you matters. Everything in front of you doesn’t matter at all, basically, as long as you don’t hit ’em. If a car gets too close to you and is inside your left rear and they get really close or they come across the rear of the car, they’ll just take it with them. Or if they’re on the outside, like on the right rear, then that takes the rear end, too. The new Delta Wing car, one of four new designs being proposed for the IZOD series starting in 2012, was a regular topic of conversation at Barber. How the radical new design would work on the track was something most drivers didn’t speculate much about. What did Patrick think of the rather wide car with a single, vertical tail fin at the rear? “I think we’re all wondering how it’s going to get around the last corner at Long Beach,” she said of the city circuit’s famed hairpin turn. What is it like, Dixon was asked, living with team owner Chip Ganassi now that he’s had the winning car in the Daytona 500 – to go along with his Indy 500 victories. “Maybe,” said Dixon with a wry smile, “he’ll start going to more NASCAR races.” Ganassi, of course, is a fixture on the pit road during IndyCar race weekends. US F1 Update: The owner of Stefan GP has confirmed talks had occurred between his Serbian team and Charlotte-based US F1 regarding a deal to get his two cars to the grid in the Formula One season opener at Bahrain on Mar. 14. “Yes, it is true we had some discussions stretching over many days, but these broke down completely on Thursday afternoon European time due to the inflexibility of certain players,” said Zoran Stefanovic. Stefanovic said that the most recent talks included US F1’s primary investor, Chad Hurley, but were not supported by team principal Ken Anderson and sporting director Peter Windsor. “I stress it was not Chad Hurley, who was open to discussions with us, but some of the other stakeholders who sabotaged the talks,” said Stefanovic. With Campos Meta readying its two Dallara-built chassis for Bahrain and Stefan GP’s cars not available, US F1 is down to its last straw – an appeal to sanctioning body FIA that will keep it in business after missing the season-opening races. It has been confirmed that the FIA’s technical delegate, Charlie Whiting, visited US F1 last week, toured the facility and had a private conference with team owner Anderson. Without a finished chassis and with conflicts between primary investor Hurley and Anderson that began with Anderson’s surprise request to start the season in Round 5 at Barcelona, it’s unclear how US F1 will continue to be funded even if its appeal to the FIA is successful. I always enjoyed the racing at Atlanta when I attended,the racing was fast and good racing thoughout the field. Wish they would bring back Indy cars also.